I know I've been M.I.A for the past few months and I am so delighted to announce my return to the blogging world! How I've missed this rambling on about whatever pops into my head. It is so therapeutic! Anyway, this my the Melbourne Dayre Ambassador Team! 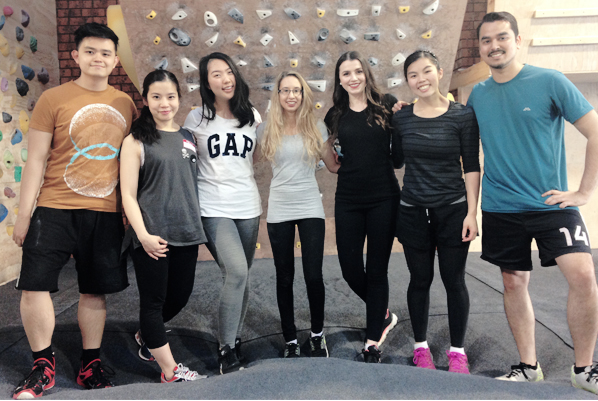 We had a a workshop which involved great amount of amazing food and a day at bouldering. Boy oh boy was that an experience! Walking into the place I thought it would easy as the walls aren't that high but once you try hanging on to the rocks, You will instantly regret not having gone to the gym to work on that upper body strength. Dayre is such a cool social media platform! It's like a combination of facebook and instagram all in one! If you love blogging and sharing your daily fun life, then dayre is for you! It has certainly been such a great experience with a lovely bunch of people. Have any of you ever tried bouldering? If yes, let me know in the comments!